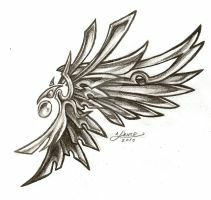 One of my many designs for wing tattoos. Could i possibly use this design on a personal t-shirt? I will give you credit printed on the shirt. Sure go ahead. That'd be pretty cool. Thank you! Ill probably have to risize it and copy and flip it to make 2 wings but im pretty sure ill put the credit on either one of the sleaves or around the collar. of course. when i get it done. i'll give you credit and everything! awesom! thank you!!!! !i'll send you a link when i get it done. Sure! Let me know when you do. It's cool to know when people actually use my designs. 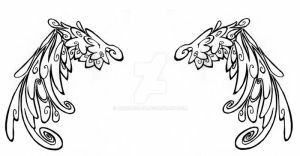 so I might get that as a design for one of my tattoos on my thigh. If that's alright. Fine with me. That'd be cool. It's awesome, different from the others. Keep up the goods! I swear That I have never seen this picture before - no kidding! I love the design. I'd get a tattoo of it if I didn't hate needles so much.